And for dessert? Mmm! 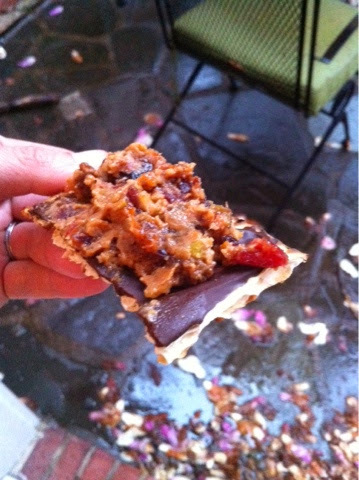 Chocolate-covered matzah topped with haroset. Ridiculously good. Slowly melt chocolate chips with a little bit of olive oil and spread it over broken pieces of matzah. Chill in the fridge until the chocolate re-hardens. For the haroset: pulse grated apples, dried apricots, craisins, and crushed walnuts in the food processor until they form a chunky spread. Wait until the kids have found the afikomen, then go to town!